WHAT AARON BRINGS TO YOUR EVENTBook a polar explorer and world-record holder for your next event. Aaron Linsdau inspires audiences to do things they never could imagine. He uses stories from Antarctica and other forgotten places around the world. Go on an emotional journey to frozen continents where a single misstep can result in death. This entertaining explorer brings energy and surprises. He creates a thought-provoking conversation that lasts long after his speech. Audiences receive takeaways that are immediately applicable to their lives and careers.AARON'S TOPICS AND MESSAGEAaron shares a message of how the common person can achieve uncommon goals. Audiences come away realizing that they can do things they thought completely impossible. His message is applicable to both leaders and teams. Create positive, permanent change in how people in your business or organization believe about themselves and what they can do. He encourages them to think about themselves in a different way. He shows people that they have far greater potential than they realize.He focuses on building grit, generating courage, and maintaining a positive attitude when confronted with adversity. People face unending and enormous pressures today. Aaron's message teaches that regardless of background, gender, or physical ability, people can achieve remarkable goals. When times become difficult, Aaron's talk helps people persevere through seemingly impossible challenges. He creates a vision of success and gives audiences tools to use in their daily lives.WORKING WITH MOTIVATIONAL SPEAKER AARON LINSDAUAaron Linsdau is easy to work with, flexible, and energetic. He eliminates a meeting planner's stress out of hiring a speaker. Being adaptable to conditions is what kept Aaron alive in Antarctica and on the world's highest peaks. He translates that skill into delivering the exact message you need. His stories engage, energize, entertain, and educate corporate and organization audiences. All of Aaron's presentations are family-friendly. You never have to worry that he might use inappropriate language or stories that might embarrass you or your organization. 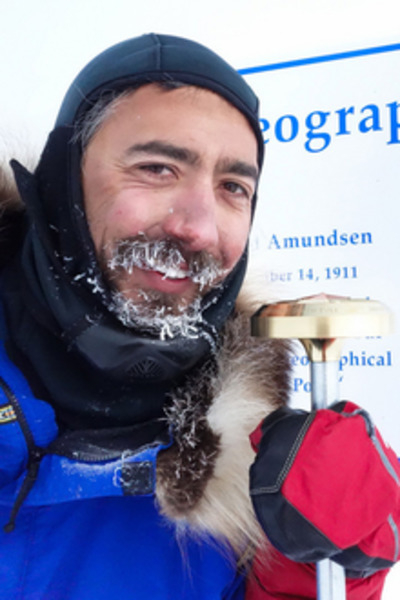 He respects the time limit and sticks to it.ABOUT AARON LINSDAUAaron Linsdau holds the world record for the longest expedition to the South Pole. Aaron survived 82 days alone in Antarctica, eating two sticks of butter every day to survive and stay warm. He has climbed on Denali solo, trekked across the Greenland tundra, and climbed Kilimanjaro. Aaron was recently awarded the National Eagle Scout Association's Outstanding Eagle Scout Award. He has authored two books and produced a documentary. Antarctic Tears chronicles his survival story at the South Pole.TESTIMONIALS"Your talk was so inspiring. You have helped me so much. I'm completely in awe. "—Paula Sprague, Farm Credit Services Southwest"I've had many people come to me after the presentation and let me what a great job Aaron did. He was pleasant to work with, easy to work with, and very positive. I absolutely would recommend Aaron as a speaker. "—Julie Hopkins, Mineral Management Specialist, Salmon-Challis National Forest, US Forest Service"You have inspired me to do something I would have never done otherwise. "—Chris Devereaux, Quilogy"Aaron did an awesome job with the presentation. Aaron gave real life practicality to an expedition that probably none of us will ever be on, but we all can learn from it. He did a great job. "—Susie Blair, Branch Librarian, Valley of the Tetons Library"Aaron's presentation was truly inspiring in that here's an individual that challenged himself to his highest potential and was alone in that venture, having to rely on his fortitude, his strength, his creativity. Yes, I would certainly recommend Aaron as a motivational speaker to organizations and to age groups at all levels. He has an engaging personality and is approachable. Aaron has a knack with people. "Valerie Maginnis, Director of Teton County Library"With the video that Aaron presented, and the obstacles that he faced...we face challenges in everyday life and that we should never give up—it was the exact message we really wanted him to emphasize during the training. Aaron's message was exactly what we needed for our retreat. Yes, I would recommend Aaron as a speaker. "Miranda Bear, Human Resources Officer, Business Center, O'Chiese First Nation, Alberta, Canada"Aaron was very inspiring and funny. I would love to hear him speak more. When I looked around at the audience, everybody was very engaged and inspired by what he had to stay. His talk continued to generate a lot of interest. His grit is inspiring. I think we need more speakers like that who can remind us of what we can do. I would definitely recommend Aaron as a motivational speaker. He has a fun way of entertaining. "Sue O'Connor, Community Organizer, Driggs, IDBook Aaron today!